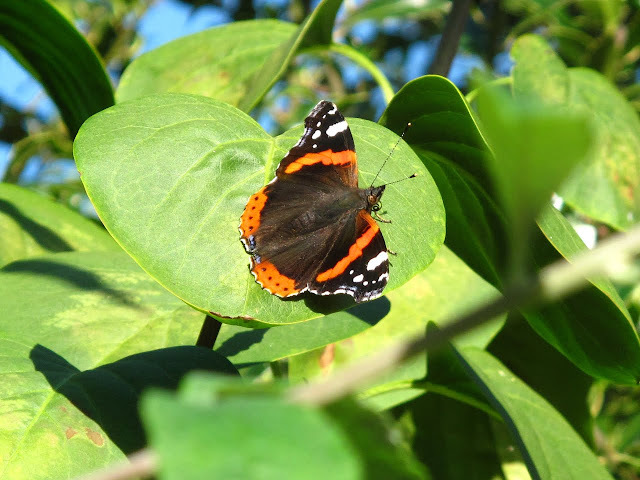 A butterfly day: Small Tortoiseshells, Red Admirals and Painted Ladies sunbathing in the morning and gorging on the buddleia blooms; Speckled Wood in their never ending spiral flights. Same old same old. I witnessed more dramatic things though. A Small Tortoiseshell left the spot on the ground where it was sunbathing and flew straight onto the middle of a large garden spider web. The spider quickly grabbed it from below, while the butterfly frantically fluttered trying to get away. The fight continued for a minute or so, then the butterfly started to flutter more and more slowly until it gave up. I didn't have my camera with me (I though I did but it was only the case, doh!) so I returned later and tried to find it. 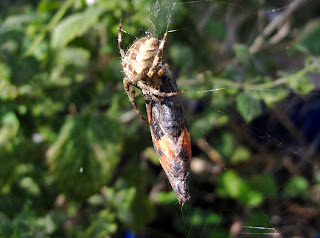 Here it is, the full spider holding onto its neat small tortoiseshell meal or the remains of it. As I was leaving the spider, two common blues, a female with a male closely following her, fluttered by my head. I watched. 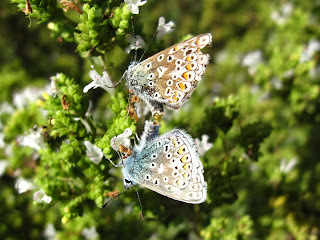 They looked like they wanted to settle, flying low amongst the bushes, and after a bit they did, on some marjoram. They rapidly took positions facing away from each other, closed their wings and mated.